My wife and I began our beekeeping adventure after a day at work turned into a honeybee rescue of sorts. 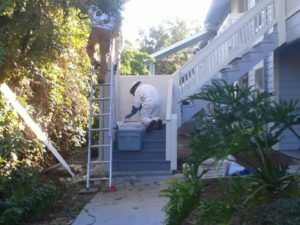 One of the tenants at the Condominium complex where I was working noticed a large swarm of bees in the soffit of a building stairwell. I decided to go and investigate and indeed found a large swarm of honeybees. Of course, the owners were determined they wanted it removed. After noticing they were indeed honeybees, I knew that spraying would not be an option in getting rid of them. Bees are just too important to our way of life and the environment. Without any prior experience with beekeeping I realized that bees pollinate a third of everything we eat and play a vital role in sustaining the planet’s ecosystems. Some 84% of the crops grown for human consumption – around 400 different types of plants – need bees and other insects to pollinate them to increase their yields and quality. These include most fruits and vegetables, many nuts, and plants such as rapeseed and sunflowers that are turned into oil, as well as cocoa beans, coffee and tea. I not only learned that bees are essential for our food crops, but are essential in cotton crops. Bees are some of the hardest working you can find. Bees depend on plants for food, just as much as plants depend on bees for pollination and reproduction. This much I understood but had no clue about raising honeybees or where to start. I still have much to learn about them and how to keep our hives healthy. After about an hour of deciding how to move forward, we decided we would call a professional beekeeper to come and remove them. I knew they would have a good home and will be taken care of. 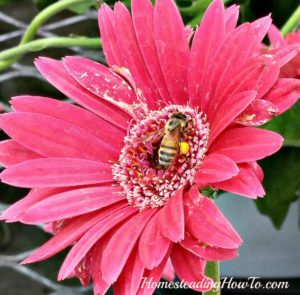 My wife and I had previously talked about beekeeping and raising bees and this was a chance to talk with her about possibly bringing the bees home. She readily agreed that we could give it a try. First, we needed to buy a hive and all of the equipment we would need to be good beekeepers—even if we were amateurs. 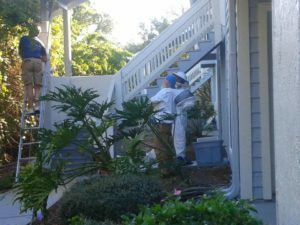 It took a day or so for the professional beekeeper to come out and start the removal process. Decked out in their suits and veils they began the tedious process of the hive and bee removal. The one thing we found with beekeeping is everything is slow and deliberate. There is a reason for that – Bees can be delicate to handle and one can easily destroy the combs they build which produce honey and provide brood for new bees to produce. With a hive tool or a knife they began the task of removing the combs from the building and placing them in the new hive frames that we purchased. 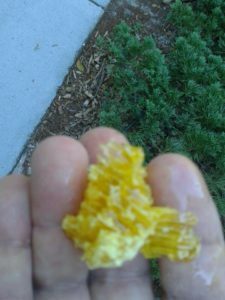 The beekeeper gave me a sample of a piece of the comb that he removed to taste the honey. It was awesome!! Most of the neighborhood is overgrown with Brazilian Pepper bushes which gave the honey a sweet yet spicy taste. The entire process took about an hour to complete. When the combs are removed and placed in the new hive frames the bees will have a tendency to follow along. For those that don’t, the beekeepers have a special vacuum that is used to gather the remainder of the bees. Don’t worry, these vacuums don’t hurt the bees. I will say that in the process, you will lose some bees but not many. Most strong hives will contain around 40-50,000 bees in them. 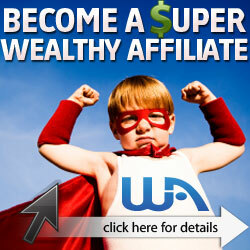 Losing some is inevitable but you shouldn’t notice a difference in the losses. 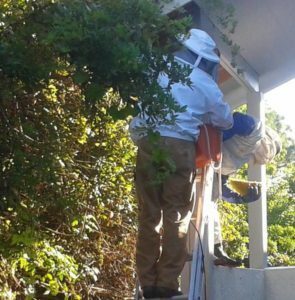 After the beekeepers were finished they immediately drove them to our house for their new home. We gathered some important pointers from the professionals and started our new beekeeping adventures. We purchased the hive and frames from the beekeeper and found a local hive builder for the smoker and tools we would need. Now for their new home! 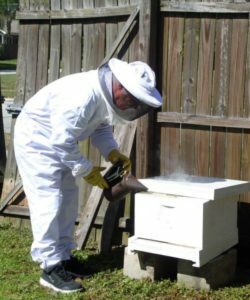 Being new to beekeeping we depended on the beekeeper to give us advice and guidance to make sure that our bees would be stable and continue building out the hive. If you are inexperienced in beekeeping, I suggest you do this to be sure the hive will survive and allow them to monitor the hive, making sure the hive still has a queen bee and no diseases. Without a queen, it wont last. In Part 2, I will highlight our experiences with beekeeping at home and give you some suggestions on purchasing hives and equipment.